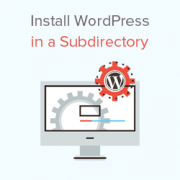 Do you want to install WordPress in a subdirectory? Installing WordPress in a subdirectory allows you to run multiple WordPress instances under the same domain or even a subdomain name. In this article, we will show you how to install WordPress in a subdirectory without affecting the parent domain name. Subdomain vs Subdirectory? Which One is Better for SEO? Normally, you would want to start a WordPress website on its own domain name (for example, wpbeginner.com). However, sometimes you may want to create additional websites on the same domain name. This can be done by either installing WordPress in a subdomain (http://newebsite.example.com) or as a subdirectory (http://example.com/newwebsite/). One question that we get asked is which one is better for SEO? Search engines treat subdomains differently from root domain names and assign them rankings as a totally different website. On the other hand, sub-directories benefit from the domain authority of the root domain thus ranking higher in most cases. An easier way to create separate WordPress sites in both subdomain or subdirectory is by installing WordPress multisite network. However, if you want to keep two websites managed separately, then you can install different instances of WordPress. That being said, let’s take a look at how to install WordPress in a subdirectory. First you need to create a subdirectory or folder under your root domain name. This is where you will install WordPress files. Connect to your WordPress hosting account using a FTP client or File Manager in cPanel. Once connected, go to the root folder of your website. Usually it is the /public_html/ folder. If you already have WordPress installed in the root folder, then you will see your WordPress files and folders there. Next, you need to right click and select ‘Create new directory’ from the menu. You need to be careful when choosing the name for your subdirectory. This will be part of your new WordPress site’s URL and what your users will type in their browsers to reach this website. Your newly created subdirectory is empty at the moment. Let’s change that by uploading WordPress files. 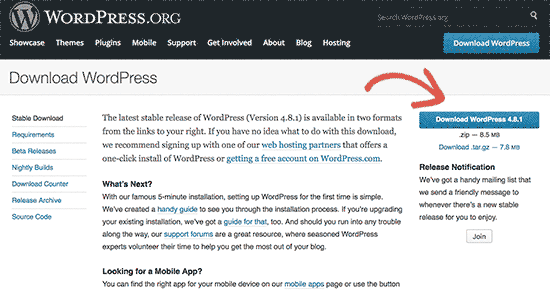 First you need to visit WordPress.org website and click on the download button. Your browser will now download the zip file containing the latest WordPress software to your computer. After downloading the file, you need to select and extract it. Mac users can double click the file to extract it and Windows users need to right click and then select ‘Extract All’. After extracting the zip file, you will see ‘wordpress’ folder containing all the WordPress files. Now let’s upload these files to your new subdirectory. Connect to your website using a FTP client and go to the subdirectory you created in the first step. In the local files panel of your FTP client, go to to the WordPress folder you just extracted. 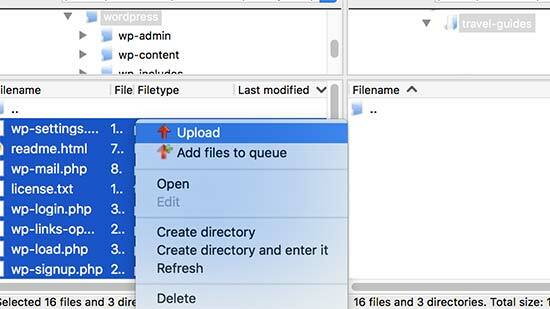 Select all files in the WordPress folder and then upload them to your new subdirectory. WordPress stores all your content in a database. You need to create a new database to use with your new WordPress site installed in a subdirectory. First, you need to login to the cPanel dashboard of your WordPress hosting account. Click on ‘MySQL Databases’ under the databases section. On the next screen, you need to provide a name for your new database and then click on ‘Create Database’ button to continue. 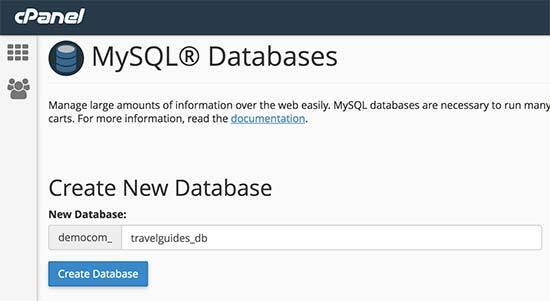 Your cPanel dashboard will now create the new MySQL database. In order to use this database you need to create a MySQL username. 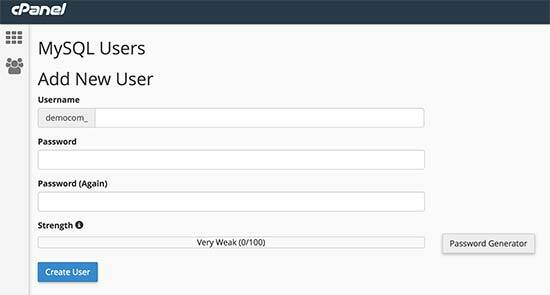 Scroll down to MySQL Users section and provide a new username and password. Click on ‘Create User’ button to continue. Next, you need to give this newly created user privileges to work on the database you created earlier. Scroll down to ‘Add user to database’ section. Select your MySQL username and then select your newly created database. Click on Add button to continue. 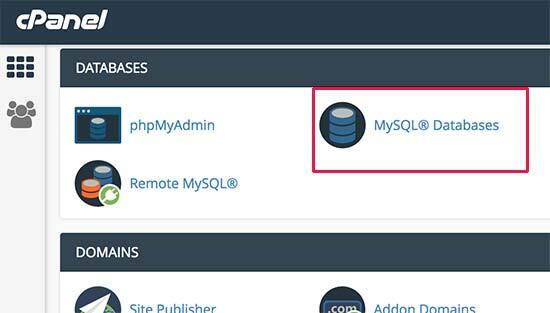 Cpanel will now grant the MySQL user full privileges on your newly created database. This will bring up the WordPress installation wizard. First you need to select the language for your WordPress website and click on the continue button. 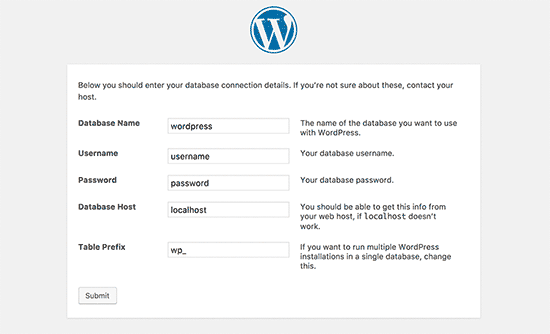 Next, you will be asked to provide your WordPress database name, database username, password, and host. Enter the database details and click on the submit button. Click on ‘Run the install’ button to continue. On the next screen, you will be asked to provide a title for your website and choose an admin username, password, and email address. After entering your website details, click on ‘Run install’ button to continue. 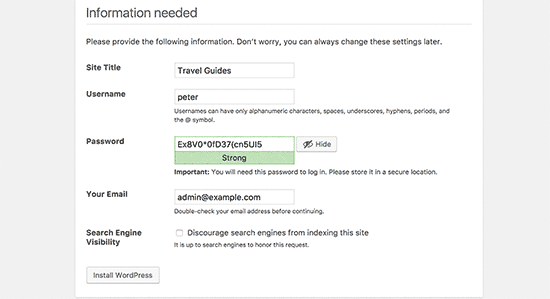 You can now go ahead and login to your new WordPress website installed in the subdirectory. If you have a separate WordPress install in the root directory, then the .htaccess files of your subdirectory will cause conflict. This will result in 404 errors on your website. Don’t forget to replace /your-subdirectory/ with your own subdirectory name. 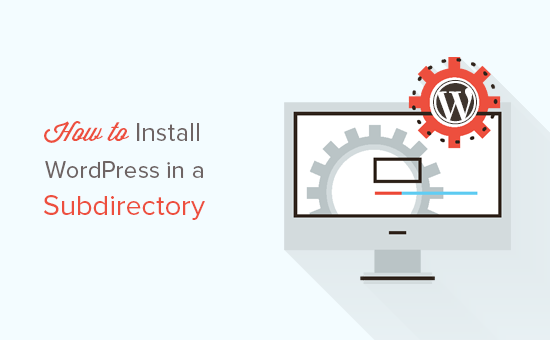 We hope this article helped you install WordPress in a subdirectory. You may also want to see our ultimate step by step WordPress SEO guide for beginners. Hey, I just followed the process except i haven’t changed the htaccess file. My site is still working properly. I am using hostinger. is changing the htaccess mandatory ? will it cause error in the future? Your host may have set up the redirect for you, if you reach out to your host they should be able to let you know. Just want to know that does this will increase the bandwidth useage and load time. Let’s suppose if I my main webpage size 1 mb and my second website size is also 1 mb so when someone load the main page does it loads all the 1+1 2mb size. Yes it will increase bandwidth usage depending on your traffic. Since both WordPress installs share the resources, traffic load on one website will affect the performance of other website as well. Wow, worked first time! Thank you so much!! My site got a white screen of death after this. Hello, I dont understand something. What is the difference between installing wordpress in a subdirectory and just creating multiple pages??? I think I did everything as shown in your instructions. But the trouble I’m having is when I’m trying to customize my theme on the subdirectory it taking me to the root domain wp customizer. What should I do then… ? I installed my local wordpress to the subdir with ftp but the problem is the css doesn’t work properly, and i don’t know what’s wrong with my wordpress, because i follow this step. simplyrent.in is currently unable to handle this request. I have heard that subdirectories are treated as part of root domain in terms of ranking.But my subdirectory is not ranking, even for exact match keyword search.I have indexed Subdirectory using Fetch as Google Tool.I don’t know what is the problem? I have submitted it to Search Console, Created separate robot.txt and sitemap (Sitemap is pending from last two days). Should I give more time to Google to Crawl by Subdirectory? It is up to search engines to decide how they would rank your website in their results. All you can do is optimize your website for SEO and follow the best practices. Thank you for this tutorial. It saved me after hours trying to understand why I was getting 404 errors all day long. Hi. I created a subdirectory with a separate WP install. It looks like the user has to create an account for the main and subdirectory and to login for both the main and subdirectory. Is there a way to let a user who has login to either the main or subdirectory site to have access to the other site without having to login again? i.e if user has login into main site, he/she does not need to login to the subdirectory site. and vice versa. By default, if you are using softaculous, you are installing wordpress to the default directory named wp. You don’t need to install manually WordPress in a directory/ subdomain, you only need to change the name of the directory where you want Softaculous to install WordPress and it will also make a database and so on. It would be interesting to show, when you have a little time of course, how to configure cPanel redirects to this subdirectory. For example, I can’t redirect my domain name to a WordPress subdirectory créé sous /public-html.